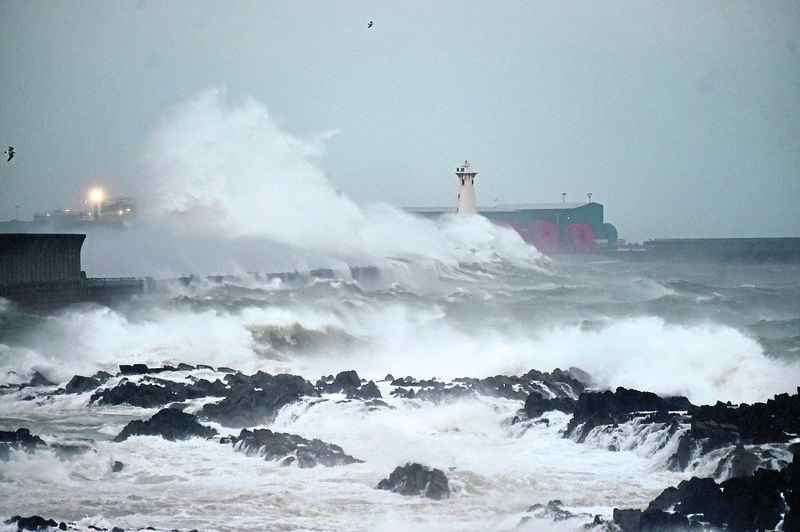 Walls collapsed, roofs were blown off caravans and hundreds of homes were left without electricity as Storm Deirdre swept through the north of Scotland at the weekend. Gusts of more than 80mph were recorded across the region as countless trees crashed to the ground to leave roads blocked. Yesterday, the snow gates were closed on the A93 between Braemar and Spittal of Glenshee and on the B974 Cairn o’ Mount road during the winter blast. The force of the wind caused the gable of a Moray house to give way during the wind – forcing the homeowner out for the night. 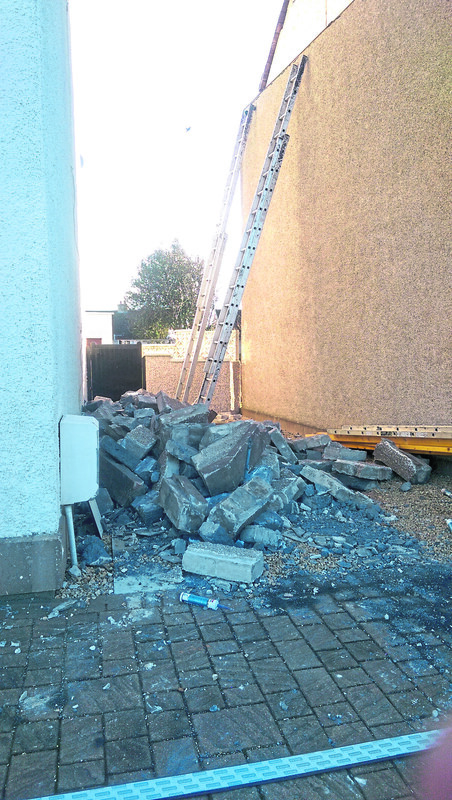 Emergency services closed the A941 Lossiemouth road in Elgin on Saturday amid concerns that the roof may entirely blow off the Harrison Terrace property before the wind eased. Bricks fell from a house in Elgin that was damaged by the wind. Resident Elsie Ralph said: “It was a really strong gust of wind. I was having my lunch when I heard a big thud. “I thought it was just the bins but when I went out they were fine, then I thought maybe the chimney, but it was ok, then I looked across and saw that part of the roof had come down. You could see right into the attic and some stuff was actually falling out. Mrs Ralph’s two sons were working on repairs yesterday and hoped to have the property wind and waterproof last night so she can stay there again. In Portknockie the roofs of at least two caravans were blown off at the Melody Brooks Holiday Home Park. Debris and insulation were strewn across the nearby clifftop park after the coastal village was battered by strong gusts throughout the day. A tree blocked the entrance to Chandlers Rise in Elgin, which made it impossible for residents to leave or arrive in their vehicles on Saturday afternoon. And earth was blown across the A941 between Elgin and Rothes in the gale force winds to create conditions similar to a sandstorm. Cars slowed to a crawl as drivers attempted to see through the poor visibility. In Aberdeen, a window was blown out at the train station on Saturday night, which left glass shattered on Guild Street and on the canopy at the front of the building. Staff and police were called to the scene but while some parts of the station were closed to the public services were not affected. Meanwhile, hundreds of homes across the north-east were still without power yesterday after the storm caused damage to overhead lines. About 600 households in the Elgin area and in Huntly and Buchan were without electricity following power cuts on Saturday evening. Scottish Southern Energy Network (SSEN) confirmed that engineers were on site in affected areas and hoped to restore power by last night. Part of a building also fell to the ground in the Deveronside area of Banff. The property, which is thought to be listed, is known to locals as Murdo’s Shoppie. The League Two Peterhead and Cowdenbeath football match was also called off 90 minutes before kick-off due to the weather. The club wrote on Twitter: “Due to high winds today’s game against Cowdenbeath has been postponed. New Arc animal sanctuary was also hit by the stormy weather. Polly the pig’s large size ark was destroyed and she was relocated to smaller accommodation. One of the aviaries was also evacuated.